Marcell Coetzee can justifiably be called the forgotten man of Springbok rugby. He’s been plagued by knee troubles since breaking down on the eve of 2015 Rugby World Cup selection. The 27-year-old has only played five games for Ulster since joining them in 2016, and he had revision surgery on his ACL in October last year, sidelining him for a further nine months. Had he been free from injury during this period of successive setbacks, Coetzee may have doubled his haul of 28 Test caps. It’s testament to the player’s pedigree that Ulster continue to back him, eagerly anticipating his imminent return to the field. With fewer than 20 Tests remaining between now and the 2019 Rugby World Cup, Bok coach Rassie Erasmus will be keeping close tabs on the flanker’s injury status. A rare breed of loose forward, Coetzee can genuinely fit in anywhere across the back row. As a junior, he played mostly at No 8 where his energy and commitment was showcased, but stout ball-carrying and natural strength made him a sensible blindside option too. Heyneke Meyer gave Coetzee his Springbok blazer in 2012, rewarding the flanker’s formidable work rate with a berth at openside. Meyer did the same with Siya Kolisi and it must be said that Coetzee displayed more aptitude for the foraging attributes needed in the role. That was then. Now, Kolisi captains the Springboks in the No 6 jersey famously donned by Madiba during the 1995 Rugby World Cup. A welcome wave of optimism has swept over South African rugby lovers. Prior to this new dawn, Warren Whiteley was touted as the player to take the helm. But injury put paid to that idea and Kolisi, along with vice-captain Duane Vermeulen, led the Boks to a remarkable come-from-behind win against England last week. This momentum surely won’t be jeopardised by installing Whiteley as captain when he’s fit again. Doing so would be a monumental misreading of national sentiment. Sentiment, however, doesn’t win matches. Whiteley’s a fine player and a wonderful leader but, realistically, if he isn’t captain, is there a place for him in the new era’s ideal Springbok starting back row? One of Allister Coetzee’s major flaws was the inability to find necessary balance to Bok combinations. In 2016, the Springboks lost to Italy with a loose trio of Nizaam Carr, Willem Alberts and Whiteley; to England with Alberts, Pieter Steph Du Toit and Whiteley; and to Wales with Carr, Uzzair Cassiem and Whiteley. The Boks won that year whenever Vermeulen was in the mix. Whiteley then broke down mid-2017. Yet, even before that injury, many questioned whether Coetzee’s apparent first-choice combo of Kolisi, Oupa Mohoje and Whiteley was the optimum triumvirate. Whiteley and Kolisi are at their stand-out best when they’re in full flight, attacking from the outside in. Having both of them in the same starting back row could tip the scales and rob the loose trio of crucial grunt. To counter this, there’s talk of Vermeulen switching to the blindside when Whiteley returns, but Whiteley and the dynamic Jaco Kriel add the most value off the bench, running at tiring defensive lines. 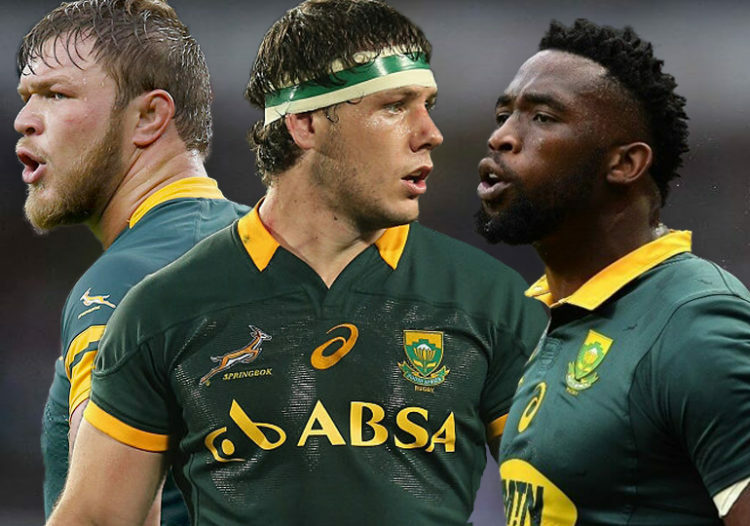 The ultimate combination, one that would allow Kolisi to play his natural game, features the all-rounder ability of Marcell Coetzee and Vermeulen’s game management and abrasiveness. Vermeulen’s positional play and defensive marshalling at No 8 are exceptional and it makes sense to retain him there, where he’s most comfortable and effective. Keep the symbolic No 6 jersey on Kolisi’s back, but play Coetzee at openside whenever necessary to make use of his foraging skills, and dovetail the two flankers on defence and attack like David Pocock and Michael Hooper do for the Wallabies. FRESH TAKE is an initiative to identify, feature and develop talented rugby writers who are not yet part of the mainstream media. Daryn, if you are to write an article about the loose trio, then really you need to discuss all the players and not just those that make your favourites list. For example the current incumbents at 7 are Jean-luc and Pieter Steph, whilst Dan Du Preeze is the only other recognised 8 in the current squad. You didnt touch on any of these chaps. How about Notche, who was really good off the bench?? I am a long standing fan of Marcel, but I fear through unfortunate injury and through a handsome crop of alternatives, his time has now passed! Daryn, that is my point “the five I’d pick”. If there is to be objective debate, one needs to discuss all the options not just those that you like, particularly the guys that are already in the position, like Jean-luc, Pieter Steph and Notsche! No doubt you’ve read opinion pieces before, Barry. I’d happily wax lyrical about all loose forward options but then our esteemed editor would remind me about required word count as well as staying on point when it comes to subject matter which, in this case, explains why – in my view – Marcell would add optimum balance to the back row that includes the captain and vice captain. I trust my response to your above comment goes some way to addressing the topic of other loosies in the mix. Stay passionate and happy Father’s Day! The issue is that you have no facts to support your view, because he hasn’t played for two years! Had he excelled during the current European season, like Faf & Willie,then you may have a point, but that simply isn’t the case, is it! How can you say a player’s time has passed and he is only 27 years old? I remember a certain Schalk Burger coming back from a life threatening neck injury and playing as good as ever. Lol! ai I think you have your obvious favorites. This article is about balance in the back row and the writer believes Marcel brings the necessary skill set to bring the best out of Siya. I tend to agree. The back row didn’t really gel that well in the 1st game. The point is that Schalk had recovered. Marcel has not as yet. Frankly, a little silly championing the cause of a guy who has played 5 games in two years and has no current form to justify consideration, whilst totally overlooking the incumbents who are there based on current form! You then talk about balance and how Marcel would compliment Kolisi! They both play 6, so they would be competing, not complementing each other! He was playing number 8 for Ulster before he got injured. He had the top breakdown stats of anyone in Super Rugby before he went overseas. He was by far our best no 6 when he left SA. He’s played 7 before, for the Sharks and during HM’s time at the Boks. I wouldn’t count anybody out if they are fit and on form. Rassie is not afraid to take gambles to see who the best players are. Weren’t you also one of the people questioning Duane Vermeulen’s inclusion? Look what his experience and skill has done for the Boks. Class is permanent and on form Coetzee is better than any of those other current flanks we have. Yes, the guys that just got a breakdown lesson from Ireland? Nice balanced view by the writer. What about moving Werner Kok to No. 6 as an out-and-fetcher. Not since Brussouw and Louw did we have a proper fetcher. Werner has technique, grunt, hands and speed. Yes he has to learn the position obviously. Maybe post 2019 this might be an option. Werner is an incredible 7s player and a wing or a centre at 15s. The Blitzbok who really impressed me when playing 15s is Ruhan Nel (again at centre of wing). Keen to see more of him in a 15s backline. As much as I like Whitely, he seems to be the common denominator in those loose trio’s that failed. Yes balance is an issue and he isn’t a big unit so needs a very finely balanced pack. At international level you do need a couple of battle ships to really get some go forward and stopping power. Kolisi and Thor simply have to the there. Pieter Steph is proving to be a good selection at 7. My wish is for Whitely to be impact player. I also really want to see Karni Augustus develop into a Duane Vermeulen esq player but with a bit more pace. The future is bright though. Pardon me Dear Mr Rant, how successful were the loose trio’s that played when Whiteley wasn’t there ? Pray tell me where were those battleships then, as I assume you are talking of the Alistair Coetzee ‘error’. Why MUST Kolisi be there by the way ? Are you perhaps assuming that his captaincy status should keep him there irrespective of his form ? If Rassie is going to play expansively ( and the jury is still out on that one ) then Whiteley is my man and captain as well if I had my way. He is a born leader and they are few and far between with all due respect to Vermeulen and Kolisi. Vermeulen’s Toulon were without a trophy this year and Kolisi’s Stormers, well quite frankly they have been abysmal under his leadership. Be careful not to fall for the hype old chap.. Cheers. Ja and the Lions are still without a trophy this year so what’s your point? Players must be chosen because they represent a team that wins trophies? Vermeulen, Willie and Faf played the biggest role in winning the past two Tests. Two man of the match performances there. Kolisi just proved what a great leader he is. Lol, your BIAS will never change. You believe in the Lions hype, when there is nothing to celebrate, no Super trophies to speak of. Only a single Currie Cup in the past 3 years Lol! btw, Elton got dropped like a bad habit for the last game much to the pleasure of many many fans with their eyes wide open. Redge, See my response to Rant just above here. Cheers. Yet another player on crutches to be dragged kicking and screaming back to SA to help Rassie win the WC ? Oh boy I’m sure glad I don’t play in SR hoping for a Bok job. Might as well go flip burgers at Burger King. Mind you, on the other hand hasn’t Rassie just handed out 16 new caps recently which must be an all time record for a new coach since the first Bok team was picked way back in 1896. I think our SR teams must have more Springboks in them than non Boks. A good quiz question would be – kindly name the only two players in the Sharks team that were not named in Rassie’s Bok squad. Maybe they were injured. I hate raining on people’s parade here but folks the AB’s don’t do it by calling back the golden oldies from pastures greener to play in tests. They build a culture around the home grown boys who are committed to AB rugby and their game is all the better for it. Ranked No 1 in the world for NINE years proof enough ?. SA has five times more registered senior male rugby players than NZ has, yet they dominate not only us but the rest of the world. Rassie has two choices imo. His game plan must be expanded well away from the failed dom krag plan of the past and he must grow his team locally no matter the cost. Black players will also get a better shot at making it to the top. Seven players ie Vermeulen, Le Roux, Lambie, Coetzee, Bismark, Steyn and Faf are all ‘white’ players which means come WC time the rest must come from our previously disadvantaged brothers if our supposedly strongest XV were chosen today and we stick to the letter of SARU’s political masters instructions. It’s only an example but what message does that send to the players who dog it out week after week in SR especially the ‘white’ fellows. The sum total of this will be a bigger ‘trek’ to the North than even the Great Trek that started way back in 1835 and SA rugby will be all the poorer for it in the long run. And a final note. Most of those aforementioned ‘golden oldies’ were pretty average to poor in Meyer’s last two and a half years anyway ( remember Japan ) and his win ratio in that time was hardly any better than poor old Coetzee’s during his stint. And next year they’ll be another fifteen months older. Matfield better watch out he could be getting a call from Rassie soon. No guys, local is lekker. I don’t agree with the opinion of the writer of this article. Marcell Coetzee was one of my favourite flankers of recent times, but the reality is that he hasn’t played consistently in 2 years and is dogged by injuries. Regarding the overseas-based players, I would only have Faf, Vermeulen and Le Roux from the group you mentioned. Forget about Bismarck and Steyn. It pains me to say this, but forget about Lambie as well. Those three players are currently the best in their positions. I cannot think of a scrummie or an 8th man playing better locally. Mind you, Nic Groom is doing quite good at the Lions. I agree with you to stick with local players as much as possible. Rather develop the new caps and keep up-skilling the local players. It’s also much better to align with them if they play for local franchises. Snyman, Nkosi and Dyanti are excellent at the moment. Bongi performs really well since he got the chance to start. We are very privileged to have a world-class front row on the bench and on the field. The return of injured players will just improve our situation. As a final note, what I really like about Rassie and the team at the moment is that it seems that they’re adapting to the situation on the field, which is already light-years better than AC’s “reign”. Yes, there will be tough times and losses ahead, but even that is tolerable if you see that the team and coach really tried their best to outplay their opponent. Yes! Glad someone is giving Marcel a mention. Definitely a great player, available at all sides of the scrum. How about we move PS du Toit back to lock and drop Franco Mostert, thereby opening a spot in the loose trio? That way, we can have our best players on the field, in their best positions. The greatest contenders for the loose trio are Marcel Coetzee, D Vermeulen, Jaco Kriel and JL du Preez. I wish to see them all together one day.